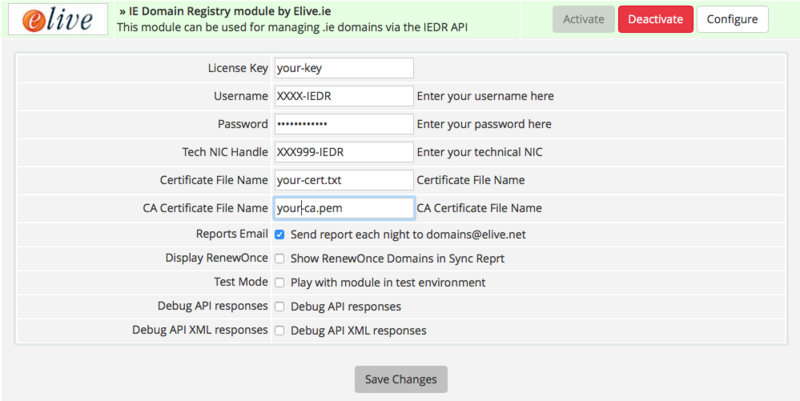 Our WHMCS-IEDR plugin provides .ie Registrars with an easy and simple method to link their WHMCS installation to the Irish Domain Registry’s API, to provide full support for clients and administrators to be able to register, renew and cancel domains from directly within WHMCS. clients with .ie Domains. 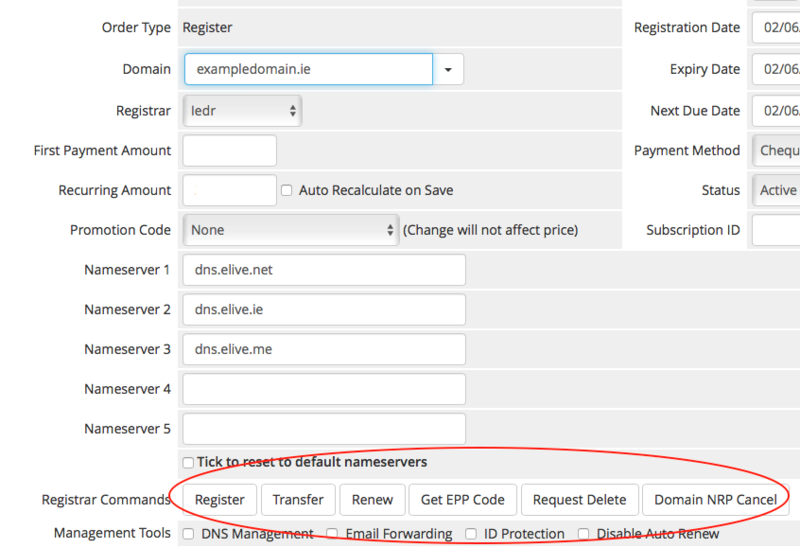 With support for all the .ie custom fields, DNS Server modifications and issuing Transfer Auth Codes, your clients can now fully manage all their .ie domains 24 hours a day, freeing up your staff’s valuable time. You can also, optionally schedule a nightly cron job that will report on domains that the renewal date in WHMCS do not match that of the IEDR. Order WHMCS-IEDR Registrar Module now for only €150 +vat once off and an annual license charge of €150 + vat that includes all updates. This includes FREE installation by one of our expert technical staff, if required. *** Backed by our 30 day Money back Guarantee. If you are not happy with the product for any reason, notify us within 30 days of purchase and we will refund you in FULL, no questions asked. PHP 5.4 or higher, MySQL 5.x, WHMCS, IonCube Loader, IEDR API Account. 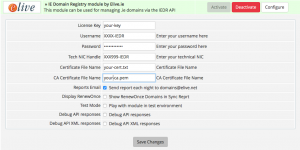 – Support for WHMCS Domain expiry date sync. – Update to Tickets Add-on – Prevent Domain Holder being changed during Transfer. – Workaround: The IEDR issue related to contacts not having a phone number or company name causing libxml_display_errors has been resolved. 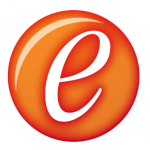 – Fix: Pasting text into fields with invisible characters causing an IEDR UTF-8 Validation Error has been resolved. – Fix: Hook to set the domain as Pending from Active when a new domain is registered was previously using an incorrect parameter in the WHERE clause. – Added: Checks to ensure phone number, company, and email fields are formatted correctly before saving contact details. The IEDR accepts any non-empty value without further validation which could cause a libxml_display_error on return if the data doesn’t match the XML schema. 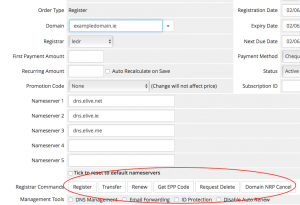 – Added: New configuration option to allow Nameservers to be left as current, or to continue to use the WHMCS default and custom ones specified in the text fields on domain transfer . – Added: More debug options in the configuration to explicitly add the configuration dumps to the client area and to explicitly include the Login command (which will contain your IEDR username and password) in the dump. Left unchecked the dumps will be limited to the admin area and will exclude the Login command. 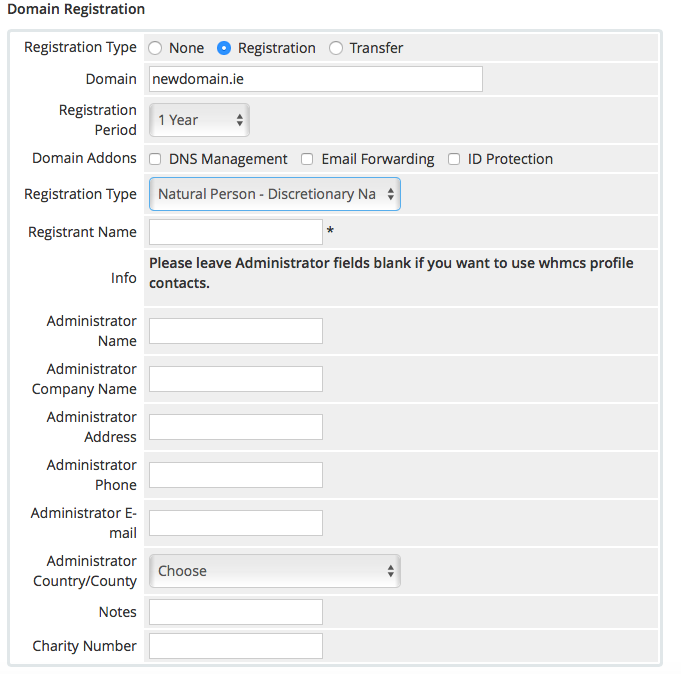 – Modified: Charity domains are excluded from the nightly reports and when renewed in WHMCS they now return as successful, without actually processing the renewal with the IEDR – which would return a response with an error. – Updated the Hook to set a domain to pending after ordering to use the domain ID instead of the name. – Formatting of amounts in the Balance Widget. – Better handling of settings, depending on PHP environment settings. – Improved handling of Debug messages. – Some code cleanup and description updates. – Included an ‘extras’ folder that has some sample customisations. Please see the README.txt file in that folder. – Implemented checking on Domain Transfer. If a ticket exists for the domain already, the transfer is not processed. – Improved handling of line breaks in Ticket Remarks updating. Bug Fix : Multiline Ticket Remarks were being sent as single lines. 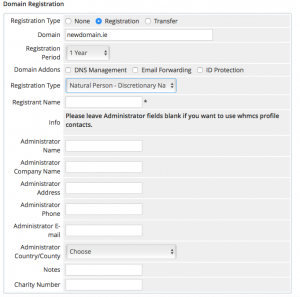 Added an tick box option during registration to set a domain to Charity. If set to No, then the text in the Charity field is ignored, so clients cannot set a domain to charity by accident. Fixed an issue for multi-year renewals. Added Config option to set the From address of emails sent from the Ticket document submission process.